I am one generation removed from a nurse marrying a farmer. My grandparents had retired before I was born, my my Registered Nurse grandma married a dairy and grain farmer. 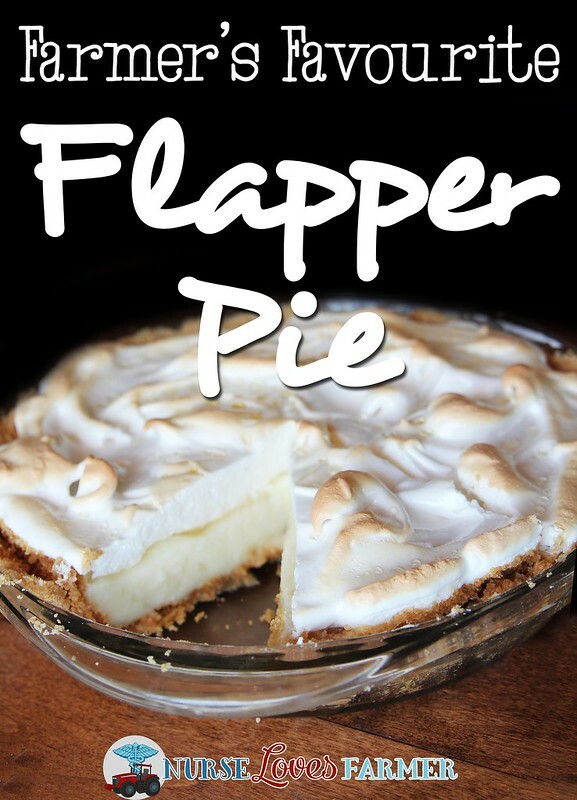 My farmer grandpa’s favourite dessert was flapper pie. Flapper pie is unique to the Canadian prairies and I am begging you to try out this amazing pie. I have made it for the last couple of farming seasons and this is definitely a farmer’s favourite pie around here! 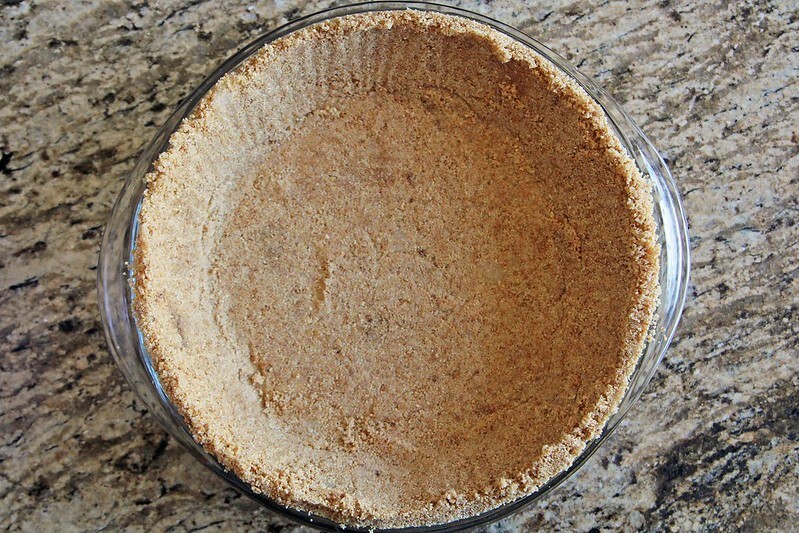 Start to make your graham crust by mixing all of the crust ingredients together in a bowl and pressing them into a 9″ glass pie plate and bake at 350ºF for 10 minutes, until crust is fragrant. You can reserve a couple of tablespoons of the crust to sprinkle on top of the meringue, if you please! I find using a measuring cup to press down the cracker mixture into the pie plate works well. It’s okay that it’s crumbly, it will set. Next put all of the ingredients for your custard in a medium sauce pan over medium heat, except the vanilla. Stir continuously until thick and bubbly—turn heat down to simmer to keep it warm, making sure it doesn’t burn. We will add the vanilla just before we pour it in the crusts, but it’s time to make the meringue quickly! 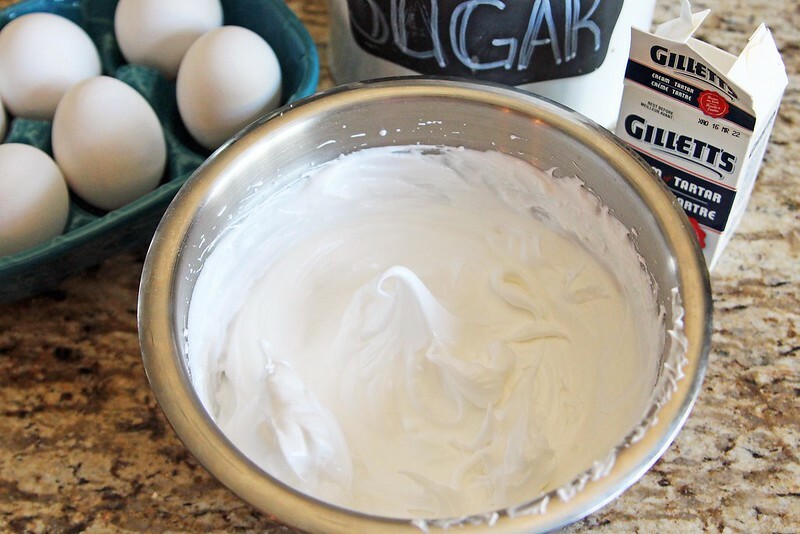 A baking hack that I’ve found extremely helpful when making meringue is to use a stainless steel bowl and chill it in the fridge, even for a little bit, before you use it—the eggs will form stiff peaks a lot easier. Also, make sure that no egg yolks are in the egg whites, or this won’t work. The bowl should also be very clean, no grease left behind or it won’t work either (I have learned the hard way!). Beat the egg whites and vanilla together with an electric mixer until frothy. Add the sugar and cream of tartar (the cream of tartar apparently helps the to stabilize the egg whites in the meringue), and beat until stiff peaks form, as shown below, and set aside (and no need to beat anymore, so just leave it alone!). Now, back to the custard on the stove! Take off head, add in vanilla and stir. Pour custard into graham pie crust and then immediately cover with meringue. Place meringue right on the edge of the pie crust first, all the way around to seal it, and gently pull into the centre of the pie. We do this to ensure the meringue overlaps the crust so it doesn’t shrink when it is baked. Make some fancy swirls with peaks so they will brown when baked. Place pie into the oven for about 10 minutes at 350ºF or until meringue tips are just starting to brown. Meringue is a fickle creature. I did some researching because any time I had ever made this pie, it tasted GREAT…but looked AWFUL! Which is why I haven’t blogged about it until now. For some reason the layer under the meringue and over the custard would “weep” and I had no idea why or what it was. I looked into it and found that you need to put the meringue onto the hot custard so it starts cooking from bottom up. I also got “sweat” or beading on top of my meringue, and that is due to overcooking the meringue and it was suggested to cook at a lower temperature of 325ºF to solve that problem. I assumed it was because I put it in the fridge to cool so soon, but apparently not! As you can see blow, I didn’t quite nail the top of the meringue because I always feel like my meringue isn’t browned enough, so clearly I overcooked it. Practice makes perfect, and I did try again with Martha‘s suggestion of to cooking at a higher temperature to avoid beading, 425ºF for 4-5 minutes which is also suggested at AllRecipes. Sigh. I still got some beading cooking at high temp for 4 minutes, but it still tastes good! Cool the pie on a rack first and then transfer to the fridge to cool for at least 4 hours…it’s hard, I know! A Canadian prairie classic that is served throughout the farming season. 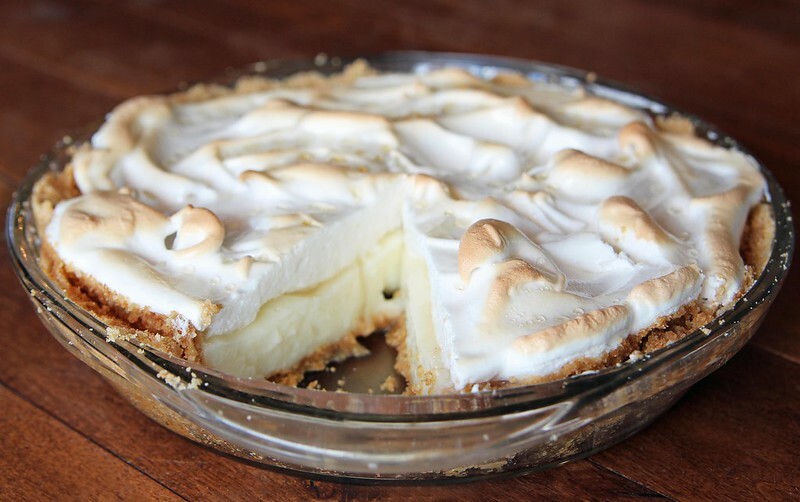 A buttery graham cracker crust, vanilla custard topped with meringue. Combine graham crumbs, sugar, melted butter and cinnamon together in a bowl, press into 9" glass pie plate and bake at 350F for 10 minutes, until fragrant. Custard filling: Mix together milk, sugar, corn starch, salt and egg yolks together; warm over medium heat stirring constantly. When thick and bubbly, turn down to simmer keeping an eye on it and stirring as needed to not burn it; time to make the meringue! Meringue: Whip egg whites and vanilla together until frothy in stainless steel bowl. Add sugar and cream of tartar and beat into egg whites until stiff peaks form. Back to the custard: remove from heat, add in vanilla and stir. 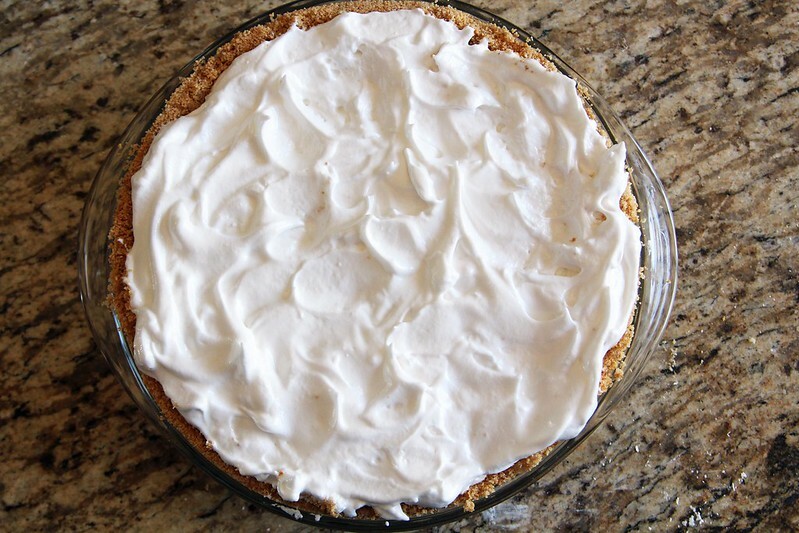 Pour into pie crust and immediately cover with meringue topping. Make sure meringue covers a bit over the edge of the crust so it doesn't shrink. Bake at 350 for 10 minutes or until browned; or try 425 for 4-5 minutes until browned. This is a messy pie! It’s why I don’t have a picture of just the pie slice on plate. It’s messy but absolutely delicious and it’s best if eaten fresh…so indulge! 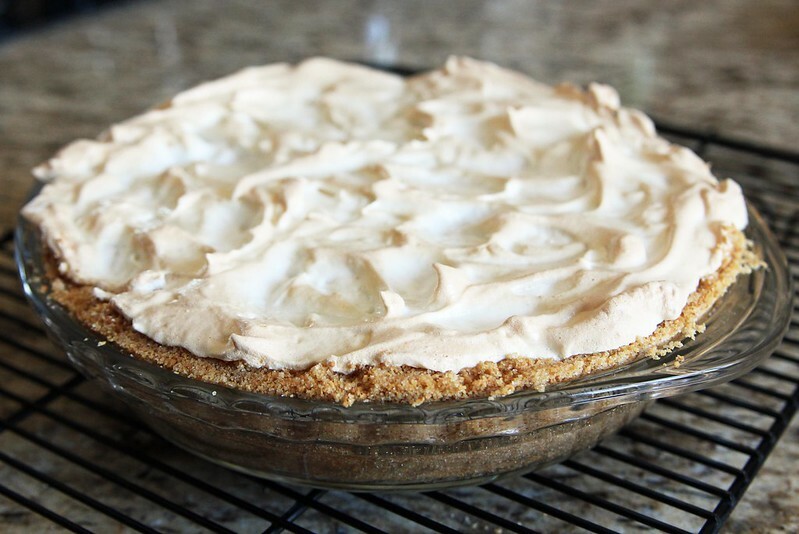 There are quite a few variations of flapper pie out there, but I have to thank this blogger for her research on the chemistry behind the meringue problems, even though I still cannot nail the top of my meringue! I always skipped the cream of tartar and wasn’t adding enough sugar and even though the pie always tasted amazing under the meringue it was goopy and runny…no more! I love The Kitchen Magpie’s custard filling and used that and my friend Alisha has a recipe for flapper pie too! Try what works best for you and report back to me! 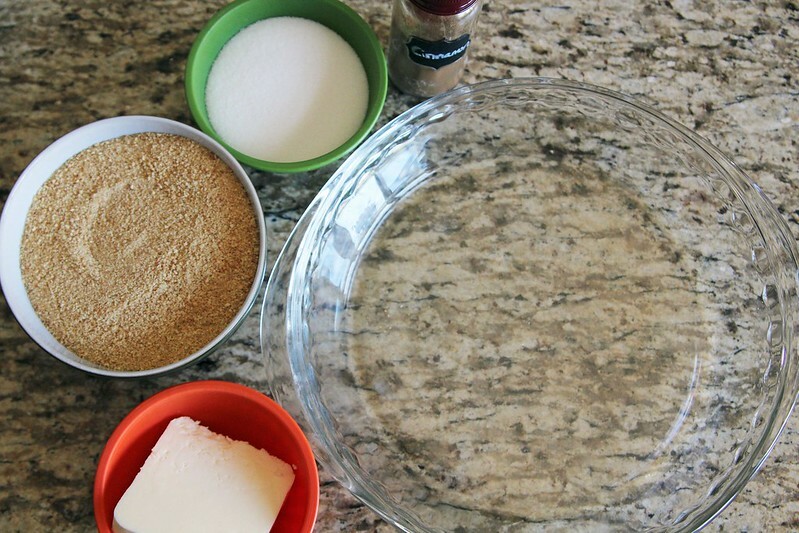 A recipe very, very similar to this has been in my family for at least 4 generations …. mine being the 4th …. from as far back as I can remember to my great grandmother. When these simple ingredients started coming out of the chicken coup and kitchen pantry, we always knew what was for dessert. (Little did we know, even in the 50’s & 60’s when mom made it, that it was actually the time when food items and money were getting quite scarce and everything needed to be “stretched”.) We never went hungry or felt deprived because we knew these ladies were always there to create something out of so very little (even new clothes). Nowadays I sometimes take our family recipe (that has always only been in my head, not the recipe box) to gatherings and celebrations. It’s raved about and complimented as something “new” and “special occasion” every time. I have never tried this classic pie, and have been meaning too, so with your post adn recipe saved, i will now be makinjg it! Thanks for sharing at our Piday Link up Party! I have always been taught to let the eggs come to room temp and make sure the bowl was at room temp when making any thing with whipped egg whites. I've never had this beading problem. Oh my goodness! That looks delish! 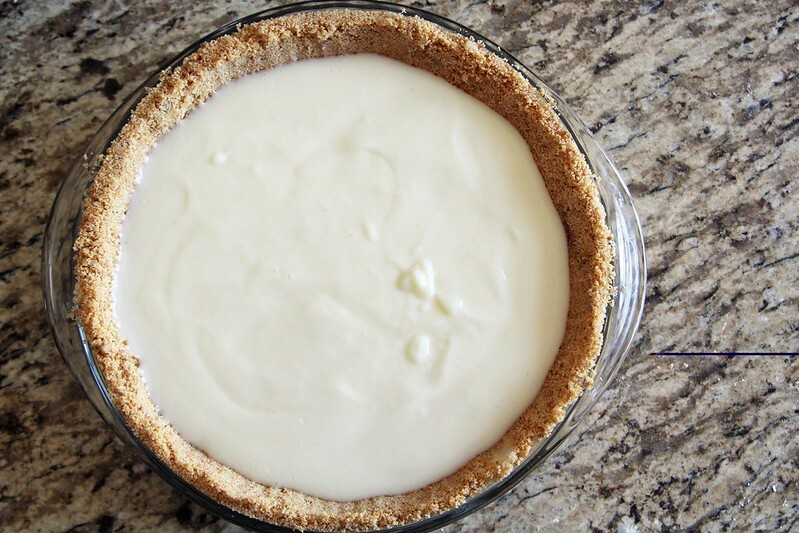 My dairy farmer husband's family calls this Graham Cracker Cream Pie, and they love it! I love to cook and bake, but have never tried making it…I think I will have to surprise him with trying this one! Ooo looks delish! Love that you added cinnamon to the crust! Great idea! I’ll have to try adding cream of tartar to my meringue next time. I am mad at meringue. Cooking higher for shorter did reduce the beading…but still wasn't foolproof!